For those of you who have spent much time in the classroom (and who hasn't? ), you know how boring it can sometimes be to have a teacher always telling you what to do. But the beauty of learning the English language (or any language), is that most of the learning happens outside of the classroom. While classroom learning can be useful, practicing every day with native speakers is the best way to pick up the way the language is as it is used in the real world. Sometimes, however, it may be difficult to find native speakers in your area. And that's where the Internet comes in. For me, the most helpful and convenient language practicing tools were completely free and available online. These are two of my favorites. People around the world use Skype to keep in touch with their friends and family practically for free. But one day, I discovered that you can use Skype to practice speaking, listening, and learning another language, too. When you change the settings on your status for Skype to "Skype Me! ", this enables people you don't know to talk to you. Because of the casual environment, you can learn in a very natural way. Some of the best language learning experiences I ever had were chatting with strangers on Skype. If you don't feel comfortable using webcam or audio, you can always stick with instant messaging. This way, you'll learn how to abbreviate in the native language. And by doing so, you'll learn very important skills in keeping up-to-date with current Internet trends, which is critical to know in our world where we must always be connected online. 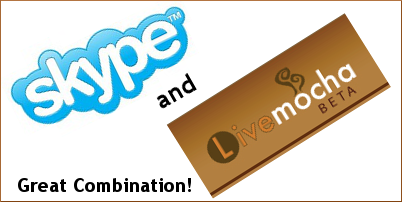 LiveMocha is a relatively new, year-old website that gives you the best of both formal and informal learning. Although you can be a paying customer, you can also do a lot on the site completely for free. My favorite feature of LiveMocha is the part that allows learners to submit writing and speaking exercises to native speakers so that they correct the grammar, spelling, pronunciation, etc. As a learner, you are also asked to be a teacher and share your language knowledge with others by helping those who want to know more about your native tongue. Another great feature of LiveMocha is that it fully uses social networking and is very similar to Facebook in its capacity to connect a community that shares common interests. If you haven't yet checked it out, LiveMocha is certainly a tool worth looking into. With both of these tools, language learning is a shared experience. By immersing yourself in a community (as in LiveMocha) or simply speaking individually with individual speakers (as with Skype), you'll be more excited about learning. And you may just get to help others learn something, too. The even exchange of knowledge with fellow learners is what makes these two learning platforms so exciting. You are right, Live mocha considers one of the best sites in learning any language. It will take you step-by-step to learn in active way. It is rely helpful information, thanks much about it and we wish to see more. Thanks once again. I have used Live Mocha for learning different languages. The community is definitely one of the strong points. I think it should be seen as one of the methods used alongside classes and other methods.